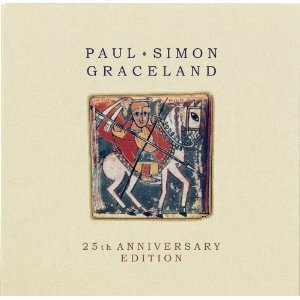 Paul Simon's album Graceland has turned 25 sounding better than ever. Its impact on music and culture is vast and any list of the best albums of all time looks silly if Graceland doesn't appear on it somewhere. The bestselling solo album for an artist who continues to produce great music, Graceland is a landmark, but not one that has grown dusty with Importance. It's not just a "significant" work with historical meaning; it's also an exhilarating collection of songs as timeless and current as ever. This is the fourth of a four-part series covering the boxed set, its cultural impact, the story of the boycott and the music itself. You can buy the album in any configuration from Paul Simon's website or any major outlet. When an album becomes as popular as Graceland, when it becomes part of the musical landscape for decades, it can be easy to take it for granted. As fans, the more we play an album, sometimes the harder it can become to actually listen to it with fresh ears. That's why a serious sonic upgrade via remastering is a great opportunity to sit down and really pay attention to an album we know so well. New remastering can reveal details that weren't as prominent before, uncover sounds and instruments we barely noticed and otherwise freshen up a masterpiece. If you listen to One Trick Pony and Hearts & Bones before diving in, the shock will be greater. Pony has the wonderful "Late In The Evening" but it's still probably the only Simon solo album that has little to offer. Hearts and Bones has a much stronger collection of songs, but the weakest element of both albums is easily the melody and arrangements. Even their sound feels dated. Compared to the supreme confidence and melodic sophistication of the Grammy winning album Still Crazy After All These Years, they clearly show an artist who is adrift. And then came Graceland. The wheezing accordion of Forere Motloheloa (the sound from which the song sprang) is immediately punctuated by alarming drum cracks. But before the mood gets too ominous, a jaunty bass line joins in and the rhythm becomes a matter-of-fact, daily routine sort of rhythm and Simon is delivering up casual lines that take us through whip-saw changes of emotion that capture perfectly the terrifying changes at the turn of the 21st century. "It was a slow day," he intones casually, but before we know it we've experienced an act of terrorism (the bomb in the baby carriage set off around civilians). This startling image is superseded by the chorus that assures us "these are the days of miracles and wonders;" people can make long distance calls, but their every movement is tracked by cameras that "follow us in slo-mo." The rush of images continues, with Simon capturing the way our political culture seems controlled by the wealthy with a casual rhyme that refers glancingly to "a loose affiliation of millionaires and billionaires." All the terrors and promise of modernity are encapsulated in this opener, which also moves along in a rush of music. Choral voices buried deeply in the background provide some comfort as the accordion carries on with its melody, happily indifferent to the chaos around it. Have I mentioned how infectious the song is? You're singing "Medicine is magical and magical is art/ The Boy in the Bubble/ And the baby with the baboon heart" before you even think about what it means. Most remarkable of all, this song is timeless and toe-tapping. It starts the album off an exuberant note. Simon finishes it by humming along quietly to the musical track that has rushed along in just four minutes. And yet, what are the last words he says to us on the first track of the most confident and exciting album of his career? "Don't cry, baby, don't cry don't cry don't cry." It's not often pop music can acknowledge the uncertainty of life without succumbing to dread or pomposity. Simon slips in the needle when we're not looking, giving us the comfort of the music even as he details exactly how scared we truly are. Finally, Simon doesn't write protest songs. But with its glancing reference to acts of violence and air of unease, he paints a picture of reality that would have been all too familiar to the people of South Africa. Paul Simon says "Graceland" may be the best song he's ever written. Given the number of tunes he's crafted that are classics, that's a high compliment. And it's probably true because "Graceland" works on so many levels. So why isn't it the opening track or closing track on Side One or Side Two? It would seem an obvious scene setter: Here we are, going on a musical journey. But Simon knows after the thunderous, disconcerting opener that people need to catch their breath. The unusual musical details of "Graceland" aren't that pronounced so it feels more familiar on first listen. So here is the strongest song of Simon's career modestly placed as track number two. As detailed in the documentary film that comes with various editions of this release, Simon got the lyrics "I'm going to Graceland, Graceland/ In Memphis, Tennessee" stuck in his head. He was sure they wouldn't last because he was inspired here by African music, not Elvis Presley. Besides, Simon had never even been to Graceland. But unlike Paul McCartney (who found better lyrics for a new melody than "Scrambled Eggs," the first name for "Yesterday"), Simon couldn't shake the lines. So he decided, hey, if he's going to write a song about Graceland he better actually go to Graceland and headed down South. As Simon said in the film, if he hadn't made the physical journey, he would never have seen the sun glinting off the river and come up with the lines that anchored this metaphysical tale, giving us one of the great opening lines in music: "The Mississippi Delta was shining like a National guitar." I don't know about you, but for the last 25 years, when I see the sun shining on a body of water, those lines almost always pop into my mind. The next ones are just as vivid as telling: "I am following the river/ Down the highway/ Through the cradle of the civil war." (Simon doesn't capitalize Civil War in his lyric sheet.) How deft is that? Graceland is the birthplace of rock and roll (in a symbolic sense, of course) and Simon's album is going to the heart of music in Africa, the birthplace of us all. Referring to the "cradle" of the civil war is both less pointed and more sad, in a way, and provides an important nod to the racial injustices that are at the root of U.S. history, as well as roiling to the surface in South Africa when the album was being recorded. But the vision of the song keeps expanding, taking in affairs of love and finally the need for redemption and the longing for paradise. "And she said losing love/ Is like a window in your heart/Everybody sees your blown apart/ Everybody sees the wind blow." Is there a better description of feeling bereft after a romance is over? And it's just one passage in a song that also includes the girl in New York City who calls herself a human trampoline (prostitute? emotional yo-yo? ), the ghosts and empties that accompany the narrator and his constant hope that Graceland will bring peace. It's all carried home by the chiming guitar of Ray Phiri and the bass lines of Bakithi Kumalo (a constant source of joy throughout the album). The level of detail in the soundscape (courtesy of the great producer and engineer Roy Halee and for God's sake why doesn't everyone use him?) is astonishing. And just to link to the past with the perfect touch, Simon is joined on the song by the Everly Brothers, his childhood idols who chime in on the chorus. It's the very definition of a standard and one of the best covers is by Willie Nelson. Here's a live version featuring Nelson and Simon in concert. This may be the most startling album on the track, the one where Simon pulls out all the stops. It's in-your-face with its embrace of all the elements of South African pop music that may seem the most jarring or "exotic" to Western listeners. And yet at the same time it's such a quintessential Paul Simon tune thanks to the lyrical obsessions that it feels like an old friend the instant you hear it. The merging of Simon and South Africa is at its very peak here. It begins and I defy you not to start dancing or at least tapping your toe and nodding your heads. The music is co-credited to General M.D. Shirinda and the euphoric vocals are by his group the Gaza Sisters. One of them says during the documentary film that accompanies the album that at times their vocals are discordant or off-key, but that's the way it's supposed to be. Like the blues, the feel is more important than technical precision. Their voices chant and sing, colliding with Simon's typically urban tale of meeting a woman at a party who was recently given a Fulbright. You're listening and laughing as Simon describes this woman checking him out: "She looked me over/ And I guess she thought/ I was all right/ All right in a sort of a limited way/ For an off night." But you almost don't notice how remarkably vibrant and just plain unusual the backing track truly is. Simon's lyrics often have a casual, unrehearsed feel to them, but this strength of his is at its peak on this album, the first one where he recorded the music first and worried about the lyrics later. (That's the pattern he would use for the next 25 years, by and large, until the very strong album So Beautiful Or So What.) His voice on the chorus battles with their singing, neither one giving ground as the percussion thumps along, carrying Simon through the next verse until they challenge each other again, capped off by the exuberant "whoop! whoop! whoops!" of the Gaza Sisters. By the finale, we're clearly not in Kansas or even the Brill Building anymore; the song ends with an instrumental flourish that sounds like nothing else in the West. In three songs, Simon, captures the unease of contemporary society, nods to spiritual longing and then touches on affairs of the heart, all with tunes that provide a rush of pure pleasure and introduce Western audiences to sounds most of them have never heard before. In the blink of an eye, people are nodding and singing along to what is essentially Mbaqanga, the "township jive" of South Africa. Remarkable. By the time we get to the fourth track, the listener is so embedded in this new music, it doesn't sound strange at all. This is the one that started it all, the instrumental by The Boyoyo Boys that got stuck in Simon's head and wouldn't get out. The accordion of Jonhjon Mkhalali seems like a friendly presence ("Doesn't most every pop song have an accordion on it?" we might be thinking at this point) and the saxophones have the tight, succinctness of Stax at its best. Less than three minutes long, given the journey it sent Simon on, this may be the most important track of his career. This is the first time most of us heard the a cappella group Ladysmith Black Mambazo, a world class talent that gained international stardom thanks to its appearance on this album and of course their innate talent and savvy professionalism. (They gained a big UK hit by licensing one of their songs for a Coke advert.) I argued that the Gaza Sisters were the most "exotic" voices on the album, the ones that might most surprise or challenge a Western listener when the album came out. Obviously, hearing LBM sing in their own tongue without accompaniment isn't a sound you hear on Top 40 radio every day. But a cappella singing is as old as mankind and appears in every culture. And LBM draws as much inspiration from The Temptations and other Motown acts as it did from folk traditions. So I think their voices here are beautiful and striking but somehow less jarring. You immediately "get" Ladysmith Black Mambazo. And if you see them in concert, their showmanship and the realization that the tight, synchronized singing they perform on an album is even more stunning and powerful in concert will make you a fan for life. This song was a late addition to the album and easily one of the most popular. It begins with that a cappella passage and would have been satisfying just on its own. The temptation might have even been there to keep it "pure" and instrument-free. But Simon wasn't trying to revel in exotica or make something "unusual." He wanted to craft a great song, just like he's done all his career. So that vocal introduction segues into yet another deliriously arranged pop tune. I wish I could do the bass lines alone the justice they deserve; follow them while you listen along and you'll realize you're hearing some of the most melodic bass work since McCartney strapped on an instrument. I've no idea what Ladysmith Black Mambazo is singing and in one of the funniest passages of the documentary film Under African Skies, Simon asks some of the singers exactly what they're singing about. One man says a passage asks its listeners, remember how in the Sixties the skirts of the girls were really short? Wasn't that great? Simon laughs and realizes he's free to pursue his lyrical muse wherever it takes him. This isn't some musty musicological experiment; it's rock and roll. At another point, a singer says they're talking about food: take the owl and cut off its head; then we'll bring it on the bus and people will think it's a chicken. See, Simon says, laughing, just take the owl and cut off its head and people will assume it's chicken you're eating. Why not? Too often, one imagines just because a song is in another language or feels "authentic," that it can only deal with traditional or noble sentiments. One message of Graceland is that music is music and you should embrace inspiration wherever you find it. Another is that people have the same desires and passions and concerns no matter where you go in the world. That philosophical point probably won't cross your mind as Simon sings about young love and tosses in a doo-wop-y "woo-hoo" on the chorus and the song ends with LBM singing "ta-na-na-na" and the great Youssou N'Dour joining in on the percussion that gives a fiery release to the surging romance. This is unquestionably one of the boldest and most complete sides of music in rock and roll. And since the CD was making the idea of "sides" to an album a relic of the past, it may be one of the last complete "sides" in rock to boot. "YOU CAN CALL ME ALL"
This song always seemed a little obvious to me, simply not as interesting as some of the others perhaps because it was played on the radio and MTV incessantly (though it was far from a massive hit in the U.S., where it had to be released and promoted twice just to break into the Top 40.) It's a companion piece to Bruce Springsteen's "Dancing In The Dark," a pop tune to draw in the masses towards a bold work of art. But just like that song, listen closely and you'll realize how bold it truly is. Like so many of the songs on the album, it contains often thunderous percussion. Here again there's a synthesizer, though it doesn't sound remotely dated the way the synths do on Hearts And Bones. The lyrics capture the dislocation Simon felt when he was recording in South Africa, a Westerner plopped into a strange environment. Though he was only there for about 12 days (most of it spent inside a studio), Simon said the racial tension was unpleasantly prominent. Coming from a guy who grew up in New York City, that's saying something. "Why am I soft in the middle/ The rest of my life is so hard" may be the perfect middle-aged complaint and the almost nonsensical chorus adds to the aura of confusion. (The Betty and Al reference is how a confused Pierre Boulez referred to Simon and his then-wife, prompting them to adopt those as nicknames for each other. A friend of mine in college had an elaborate theory that "Al" referred to Abraham Lincoln and he tied it into the album's history of being recorded in South Africa. I raised an eyebrow but at the time couldn't prove he was wrong.) This is another chance to notice Simon's versatile background vocals, which color the album in subtle ways. Here he's almost grunting along with the music, doubling his voice on key lines of the chorus (such as "If you'll be my bodyguard" and "I can call you Betty") and so on. Session great Adrian Belew (also an artist in his own right) shines here on guitar synthesizer, as he did on "The Boy In The Bubble" and will on "Crazy Love, Vol. II," reminding us not to overlook the key creative talent involved in turning the jam sessions recorded in South Africa into pop songs shaped for the lyrics Simon would write. Again, if you listen to this album on headphones and really pay attention, certain details will jump out at you. Many, many tracks have thunderous percussion and drumming. But how unexpected is it to hear the massive thump that begins one of the quietest tracks on the album? That percussive sound (almost like thunder) is repeated more quietly throughout the song, a tune you probably remember mostly for its gently beautiful verses and the iconic lyric on the chorus. "These are the roots of rhythm and the roots of rhythm remain" is as clear a calling card for the album one could ask for. Simon duets with Linda Ronstadt and her childhood memories provided the inspiration for the lyrics of the second verse. On tour, Simon sang the song with the great Miriam Makeba, but Ronstadt belongs on the album. She's one of pop's great voices and as a talent is one of the most musically adventurous in rock history. As a woman (I can't think of any other reason), she hasn't received her due for how bold and exploratory she's been throughout her career. But Ronstadt embraced country and folk and pop and rock and what would be known as Americana throughout her career, not to mention venturing successfully into operetta with Gilbert & Sullivan. When she recorded this song with Simon, Ronstadt was deep into her collaboration with arranger Nelson Riddle on classic standards, a genre she was first roundly mocked for singing but which proved hugely successful. By the time her third album of standards came out the same year as Graceland, even doubters would recognize she'd grown mightily in her chops as a torch singer. One year later, she was belting out Mariachi music and earning the respect of traditionalists. You can take music you find and use it as a launching pad or find inspiration by respecting its origins. Neither path is wrong and Ronstadt -- who has received more Grammys in more genres than any other performer in history, I think -- is a genuine trailblazer and her presence here is fitting. But again, there's that thunderous percussion, which reasserts itself throughout this song that encompasses perhaps the birth of Christianity and music itself. That thomp that punctuates the desire to express yourself artistically, the constant need for rebirth that all artists must face and which Simon succeeded so completely at here. That unexpected thwamp, which seems so out of place in such a gorgeous, almost contemplative song and yet which belongs so completely you almost don't notice it. And then the coda, which lets all the rest of the music drop away while the percussion by Ralph MacDonald continues in its striking pattern, long after you imagine it would stop or fade out. It's those seemingly incongruous, unexpected sonic details that keep songs like this forever fresh. And of course Ronstadt sings the hell out of it. This album contains more co-writing credits (five) than any other album in his career. "Homeless," the second track with Ladysmith Black Mambazo, is the final one. "Diamonds On The Soles of Her Shoes" is the pure pop collaboration that occurred when LBM came to New York City. They later performed it on Saturday Night Live long before the album came out. This song, with its imagery from nature ("Moonlight sleeping on a midnight lake") and its tale of people left homeless by a storm sounds exactly like what you'd expect from a born and bred New Yorker looking to get inspiration from the music of South Africa. Eight tracks in and Simon finally does the "obvious" but he does it beautifully, collaborating on equal terms with LBM so that the tune feels like a genuine melding of their talents rather than an artist calling them in for backup singing the way pop singers cue the choir when they want to add a little gospel feel to their latest ballad. For a globe-trotting effort that was recorded in South Africa and on both the east and west coasts of the U.S., this is the only track recorded at Abbey Roads studio in London. Of course, it's also the only one recorded a cappella and is a highlight, a triumphant proof of how much elasticity Simon had when approaching this project including the ability to step out of his comfort zone. "ALL AROUND THE WORLD OR THE MYTH OF FINGERPRINTS"
Graceland has been simply peerless for the first eight tracks. For me, it's always had a bit of a soft landing. "Crazy Love Vol. II" seems a little less anchored lyrically, then the other tracks. Also, I understand how the last two tracks bring the musical journey back to the U.S., both by showing how zydeco and township jive have a lot in common and then rocking out with Los Lobos at the end. For a long time, that seemed a little too neat and schematic to me, clarifying a point the album had already made implicitly and with more verve. Just as Sgt. Pepper has one or two weaker tracks (though we may disagree on which one or two) there is invariably a personal preference that creeps into consideration when talking about a world-beating collection of tunes. And all three have elements that strike you on a careful listen after all these years. I love how Fat Charlie the Archangel "slopes" into a room; it feels like a word that Simon would have chosen in his collegiate days with Simon & Garfunkel and seeing him knowingly using it here feels charming; he knows it calls attention to itself and he doesn't care. "That Was Your Mother" I've always felt should have been the last track (with "All Around The World" not making the cut). The music with Good Rockin' Dopsie and the Twisters may have squared the circle of his journey too directly but gosh it's fun. And the imagery of a girl who is "pretty as a prayerbook/ Sweet as an apple on Christmas Day" is just about perfect. Simon himself probably isn't too fond of "All Around The World" due to the charge of Los Lobos that they deserved a songwriting credit for jamming with him while the song was created. Simon says they never raised an issue till the album became a massive success and it was just a legal thing engendered by lawyers. It's an interesting issue since it goes to the heart of sampling, collaboration and the "colonial" usurping of local, "authentic" music that once dogged this album and anyone who had the temerity to grab inspiration anywhere they found it. (George Harrison plays sitar on his new single? Poser!) Of course, Van Morrison had jazz musicians jam while creating and recording Astral Weeks. The musicians deserve all due credit but would there have been an album at all without Morrison and his vision and lyrics? If he's the one picking and choosing, isn't it possible he's the author? Mind you, there's an imbalance of power when you see little known studio musicians playing on an album by a world famous artist. But at this stage in their career, Los Lobos were major critical darlings and poised to have the biggest success of their lives with a cover of "La Bamba," itself a combination of "traditional" Latin American music with rock and roll. The more things change... Lyrically, the final track is rather oblique. The myth of fingerprints is that we're all unique when from a certain perspective we all have so much in common. The myth of fingerprints extends to entire races and countries and is the source of reasons for war throughout history, hence the former army post happily "abandoned now just like the war." In the very last line, the former talk show host says the myth of fingerprints is why we must learn to live alone. So the album begins by pleading with us not to cry and ends with us needing to learn to live alone, that is, without interfering with one another or thinking we're special and different and better than anyone else. The music ranges from the most elemental (human voices raised in harmony) to contemporary rock to a melding of music from around the world that makes barriers and genres seem passe. It "samples" found music, collaborates across languages and creates an album that is one of the most joyous, complex and rich in rock history. P.S. The final track also contains these lyrics: "Well the sun gets bloody/ And the sun goes down/ Ever since the watermelon." I haven't the foggiest idea what "ever since the watermelon" could possibly mean. Is it a reference to some folk tale or myth? Anyone with ideas of what it alludes to, raise your hand. Note: Michael Giltz was provided with a free copy of the deluxe boxed set with the understanding that he would be writing a review.